I want to begin by apologizing to all our customers for any trouble they may have had related to mozzarella from our store this week. If you recently purchased a mozzarella that was not to your satisfaction, please come in and let us know. We will happily refund your money or replace your mozzarella with a fresh one, just let us know when you come in. We’ve been having some trouble with our suppliers. This week of July 13th will go down on the record as “mozzarella hell” and I will refer to this week as such for years to come. Let me tell you why. The story revolves around two suppliers, CW and NJ. On Monday I ordered a case of buffalo mozzarella from CW and I decided not to order our fresh mozzarella from them. For the last few weeks an increasing portion of our mozzarella order was arriving with brown spots. I would set those pieces aside, call my sales representative and receive a credit for those; problem solved, except for the fact that I had less stock to sell for the weekend. My sales rep was aware of the mozzarella problem, I had complained to him and asked him what the problem was- were they sitting in the warehouse too long, were they on the delivery truck too long and what changed? No response. It was disappointing but was a problem that we were able to absorb. On Tuesday I came to work and found that two customers had called the night before and complained that the mozzarella they had bought during the weekend was sour by Sunday. I was angry with CW because I had no way of knowing that those mozzarella were bad, they looked normal. I was embarrassed. I wrote a very angry letter to the regional manager of CW (whom I met two weeks ago) along with copies of the notes from my customers. I didn’t hear from CW so I decided to order my fresh mozzarella from another supplier, NJ, and I expected it to arrive on Wednesday. Wednesday morning and it seems that the delivery from NJ is late. I call the company and they told me that they are having computer trouble and that all deliveries are running 5-7 hours late. We start to tell our customers that we are switching mozz suppliers and that the delivery is coming that evening and offer the buffalo mozzarella from CW. Soon after, a customer comes in and says that the buffalo mozz he bought yesterday was sour. We check another bag and sure enough, all the pieces are bad although none are bubbled or have any indication of their expiration. Now I’m really mad at CW and I call my rep and demand he find out what is going on. He tells me that he can give me a credit on the buffalo mozz but he doesn’t really know what’s going on. He told me that he asked one of his other accounts about the fresh mozz because, apparently, I’m the only one who has been complaining about this problem. The local restaurant that orders the same mozz from CW has noticed that the mozz have been arriving with spots but that they just cut those out before they cook with them and didn’t think to report the problem. How gross. I left the store before the NJ order arrived because they said that the driver from NJ won’t be there until 7 pm. Thursday morning I looked around for the mozz from NJ but there is none and it’s not even on the invoice. I call NJ and ask for my sales rep, J. My rep is not there today but E says that he can help me. I explain that I ordered two cases of mozz on Tuesday with a woman but there is no evidence of those pieces on my invoice. E says he’s going to do some digging around and call me back. While I’m waiting to hear from E I’m trying to figure out what to do because another day is passing and we don’t have any mozzarella. Should I drive up to the CW warehouse and pick mozz in person, making sure its fresh? Drive to NJ and pick up my two cases in person? Drive out to another supplier in VA and pick something there? See if NJ can ship me the mozz overnight? E calls back at 11:30 and says that he found my order, he sees their mistake and he offers to overnight ship the mozz before I even have the chance to insist on it. I am relieved that I won’t have to spend Thursday driving around and that I will be able to enjoy my day off on Friday knowing that mozzarella is on its way. On Friday morning my assistant manager DJ calls NJ because it’s 11:30 and the mozzarella hasn’t arrived. The woman at NJ says that the mozzarella was shipped out yesterday but that it won’t be at Piazza until 3 pm because it costs (them) twice as much to get it to us before noon. DJ is angry because Friday morning is second only to Saturday morning in sales but she bites her tongue because she figures that the lady at NJ doesn’t know that. At 2:50 pm the mozzarella still hasn’t arrived so DJ calls NJ again and asks the same woman for the tracking number of our package. The woman tells her to hold on while she looks for it. She comes back and informs DJ that the mozz never got sent because while they were packing it up on Thursday they noticed that it was out of date and decided not to send it to us. So why had the woman at NJ told her that it was on its way?? She answered that she had heard the delivery guys talking about the mozz yesterday so she had assumed it had been sent out. She doesn’t know why no one called us but E isn’t there and neither is our rep, J. So DJ calls me and asks me what I want to do. The sad thing is, at this point, I’m not surprised that there is more drama. I mean, since Monday, I have burned my arm pretty badly, cut my finger, found out that farro won’t be available until the end of August, forgotten to go to a radio interview, forgotten to order Sesamo bread, and realized too late that Altimura bread and provolone were out of stock (and today this post was completely erased and had to be re-written)! Why couldn’t something else go wrong? I called NJ myself. I asked for the woman who was there earlier, the man on the phone said that she was gone but that he could help me. I told him the whole story and I said “whatever can be done at this point NEEDS TO BE DONE, send me ANY mozzarella.” He said they don’t send things out on Fridays. I said drop it off at a shipping center. He said that was unnecessary because they don’t have any mozzarella. Nothing. No ovaline, bocconcini, ciliegine, loaves, NOTHING. He said nothing can be done until Monday. I told him that it was too bad that I hadn’t known about this yesterday because now I’ve missed a big shopping day at the store, I’ve been telling my customers all week to please be patient because mozzarella is coming and now its 3:00 on Friday and I don’t have any options??? Thanks for nothing. At that moment I was on my way back from Salisbury (that’s another story) and I realized that I had to continue onto Annapolis (where I had gone last night and the reason I had to go to Salisbury) and beg a store for enough mozzarella to last us for the next five days and return to Easton during Friday rush hour. Today is Saturday and we have mozzarella and we’re not making any money but at least we don’t have to make any more excuses. To all our customers, my apologies and please forgive me, this week was mozzarella hell. Last weekend I went up to New York to the Fancy Food Show, it’s a big deal in the food world, there are thousands of companies represented and thousands more who attend. It is an especially good trade show for us at Piazza because after Americans, Italian companies reserve the most booths. After a walk through the Italian section you forget that you’re in the US! There is a price to pay for going to this kind of show, tired feet and a stomach ache. You can’t take samples off the premises, I think I must have tasted about 40 cheeses in one day! I tried four buffalo milk cheeses from Lombardia; one was soft like a brie, another was a cacaocavallo, big and almost floral in flavor. I tried a sheep’s milk cheese from Lazio that is coagulated with thistle flowers, a little goat cheese from Vermont, a cow’s milk cheese from the Veneto that is aged in hay, chamomile and mint and many more. A new thing was spreadable cheeses from Italy, a spreadable parmesan cheese with truffles, and another made with sheep’s milk. I tried a wonderful pecorino from Calabria that I bought the next day at the supplier’s warehouse because we liked it that much. Another instant purchase was Porchetta, a juicy rolled ham that includes dark and white meat and a little crispy skin, we tasted it hot from the oven and couldn’t resist. This past weekend I used some on homemade pizza and at the store it is a sandwich special today with provolone and onion jam. I also tried some Lemon Honey from Sicily which was perfect with fresh apples (the case just arrived at the store) but would probably be even better with grilled peaches! 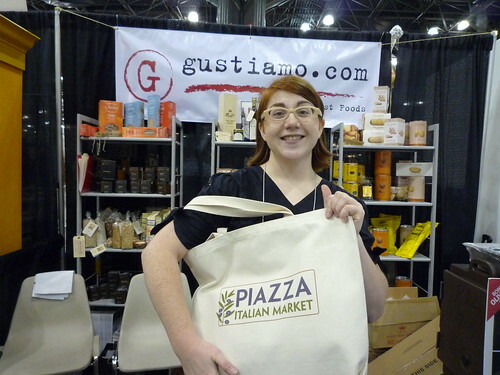 I stopped by the booth of Gustiamo, where I had some wonderful samples of cookies that you should look out for soon. I also tasted some of their super-aged balsamic vinegar with strawberries, which was awesome. The samples were just flowing like water! I said hello to Ali at Italian Products where I met one of the owners of Mirabassi, the Sienese company that specializes in Panforte. We are getting their fig and walnut panforte for Christmas. We saw Lee Green from the Scrumptious Pantry who hosted a very fun tasting with us last week (more on this to come). I also found out that Creminelli will be making wild boar salami by special order for Christmas!!! There weren’t any available samples but, if I know Creminelli the salami will be nothing short of fantastic. Can’t wait. It was not all good news at the show, there were some empty booths which I’ve never seen before, and we learned of some bad news. Caffarel chocolates are not available in the US at this time. I’m sure that someone will pick up the account in the future and next year the booths will probably be full again! While the vegetables were softening, we tasted three kinds of salume: bresaola (beef), salami toscano and (not so) hot coppa and also three kinds of cheese: marinated feta (cow), pecorino pepato (sheep) and gran pascola (goat) with dried cherries, chestnut honey and cogna jam. Chestnut honey seemed to be a favorite for pairing with cheeses and everyone liked the salami Toscano from Fra’ Mani. Everyone was in the spirit of things when the pasta was ready and by the time it was dusted with parmigiano we all dove in. The best way to find out about upcoming events is to join our mailing list. Last week the Campionate Mondiale di Pizza was held in Salsomaggiore, Italy. Participants come from around the world, as pizza has become an internationally loved food, but the US team is a strong force!! So is team Sicilia, pictured at the left. The US team seems to take home the “fastest” and “largest” prizes, the Japanese focus on winning the “acrobatic” prizes and the Italians concentrate on the “traditional” and “Napoletan” prizes. You really must see these guys in action, they are all amazing!! The end of the video has some unbelievable acrobatics shots, at one point there are three guys spinning dough in unison like a step team! Team USA has an excellent website, please check it out here. Yes, it took us too long to bring you salads but there are here now! We have two sizes of salads, a small green side salad for $1.75 and an entree salad with cubed salami and mozzarella plus a hot pepperoncini for $6.95. Both salads come with balsamic vinegrette on the side. We have added a few new cheeses to our inventory– if you haven’t been introduced, please meet marinated feta. This is the first cheese at Piazza that is NOT from Italy. He comes from Australia, is “Persian-Style” and wins over all worldly discerning palates; except maybe the Greeks who fiercely defend their own feta. In addition to the marinated feta we have a pecorino-style cheese from Bellwether Farms in California called San Andreas Crucolo from Friuli and Marzolino from Tuscany. Crucolo is sort of a big hunking cheese with lots of little eyes that tastes sweet and sour and definitely rich. It is more full in flavor than the Tavoliere, which looks just like it. Marzolino is a fresh sheep’s milk cheese that looks like a rare forest mushroom-top. Made in the month of March, Marzo in Italian, the appearance of this cheese marks the arrival of a new flock of lambs and the beginning of the new growing season. Marzolino is delicate and buttery, a perfect cheese for a picnic, if only we could do away with these April showers. It is also excellent shaved over spring pea shoots or other little greens that are just beginning to poke out of the ground. If San Andreas is from California, then California might be the 21st region of Italy. Bellwether Farms has been around since 1986 and they seemed to have it all figured out. San Andreas is so concentrated and deep and sheepy well, if I didn’t know better, I’d swear it was Italian.